Prime Minister Kamla Persad-Bissessar and Mrs. Zalayhar Hassanali display the book "Zalayhar, the life a First Lady". 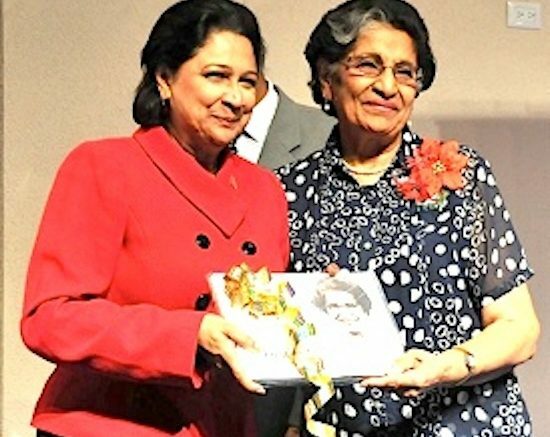 Prime Minister Kamla Persad-Bissessar praised Zalayhar Hassanali, wife of former president the late Noor Hassanali for her contribution to society in her role as caretaker to her husband while he held office. Persad-Bissessar said even before the country had its first female Prime Minister, there were women in society like Hassanali who inspired younger generations through their courage and their actions. She described Hassanali as strong, but humble and graceful, and thanked her for being an inspiration to her and other women in the country. Persad-Bissessar recalled a visit of Hassanali, who accompanied her husband to the Hugh Wooding Law School when she was a student when Persad-Bissessar admitted to her then that she was always her role model. She acknowledged that they both came from Siparia and Hassanali was able to move from this rural area to Port-of-Spain then assumed the role of being president’s wife without losing her true self and neglecting her charitable duties, which she took up at the age of 20. “Zalayhar remains a role model for all in a time when the social fabric of the country is threatened with crime and violence, a time when we are badly in need of heroes, especially women heroes. I wish to say tonight that this publication is a timely portrait of a person that all could look up to and emulate,” Persad-Bissessar said. 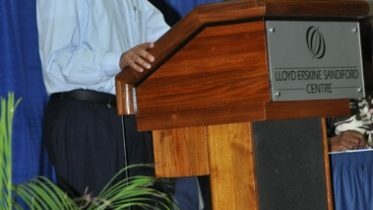 The Prime Minister also thanked the editors and writers of the biography. “This is more than a biography in telling the story of the life of a woman. This ensures the country’s history appropriately documents the contribution of women to the building and progress of the nation whether it is as charitable workers or inspirational guides,” she said. She expressed hope the publication marks the beginning of similar projects being undertaken by the writers and other academics. Be the first to comment on "Zalayhar – Life of a First Lady"